Photo of Michael Mansfield which appeared in a June 26, 1983 Chicago Sun-Times article entitled, “Terror, heartache in Rolling Meadows,” written by Michael Cordts. It was pouring down rain in Lincoln, Illinois the evening of Thursday, September 18, 1975. For most Lincoln Junior College students it was an ideal night to catch up on their studies, but for one stealthy and daring student, studying was the furthest thing from his mind. Shortly after 9 p.m., two female students entered their dorm room at number 124 Hoyle Hall to discover they were victims of yet another campus break-in. The college had experienced a rash of burglaries in the preceding months occurring at a rate of, at least, one a week; the most recent theft had been a synthesizer stolen from the music department. The girls’ record collection was certainly something of worth, but the biggest loss was a custom-made B.C. Rich acoustic guitar valued at $682. The combined number of records stolen totaled 150. Nearby, over in Carroll South dormitory, Michael David Mansfield, an honor student and college disc jockey, was alone in his room when he heard the knock on his door between eight and nine o’clock. On the other side, 20-year-old Russell Albin Smrekar, a repeat offender from Joliet, was standing in the hallway, soaked, and holding a sizeable stack of record albums. He was stealing away for the weekend and wanted to store the records in Mansfield’s room, temporarily. Michael, a shy, non-confrontational 19-year-old from the Chicago suburbs, figured the records were stolen, but he did nothing to stop his brash friend from making three more trips in and out of his room carrying in more albums; he was intimidated by Smrekar. At approximately 9:45 p.m., Michael’s roommate, also a college DJ, returned to Carroll South with his girlfriend to find the door to his room locked and a “Do Not Disturb” sign dangling off the knob. Sensing something fishy going on, they didn’t bother to knock. After unlocking the door and barging into the room, they encountered Mike and Russell sitting on Mike’s bed, “appearing wet,” with their heads hung down and “acting nervous.” No one spoke a word. Feeling uncomfortable, the roommate and girlfriend promptly left. Smrekar skedaddled soon thereafter and hitchhiked home to Joliet, with the guitar. After everyone had gone, Mike panicked and dumped all the records near a trash shoot under a stairwell in his dorm. The next morning, word had spread about the Hoyle Hall burglary. The records had been recovered from under the stairwell, but the guitar was still missing. By this time, Mansfield’s roommate suspected Mike and Russell were the thieves and had reported them to the Student Activities Director, Mr. Hartnett. Additional witnesses reported seeing Mansfield with the stolen property. Mike said he had nothing to do with the actual burglary and knew nothing about the guitar. While he was taking the rap, Smrekar was biding his time in upstate Joliet. 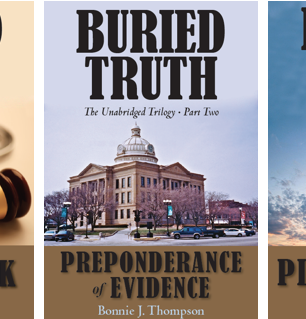 Sunday evening, September 21st, Lincoln Police Detective Thomas Maurer questioned Mansfield about his knowledge of the burglary. Mike admitted to helping Smrekar hide the records under his bed when his roommate showed up but then immediately unloaded them after Smrekar left his room. Despite Mike’s candid admissions, he was ultimately arrested for 2 counts of Theft by Possession: 1 count for Theft Under $150 and the other for Theft Over $150. He was later released on his own recognizance. That same Sunday evening, Hartnett and a couple dorm directors were patiently waiting in Smrekar’s room for his return. For quite some time they’d suspected he was the campus burglar; for one reason, nearly every room in his dorm had been burgled but his own private room. The dorm directors had also awarded Russell as “the student most likely to spend the rest of his life in jail.” Hartnett went on the warpath and began grilling Russell who was angry that Hartnett had gained access to his room. During the middle of the debriefing, some male students entered with baseball bats and threatened to pulverize Russ if he didn’t tell them what he’d done with their stolen belongings. Without batting an eye, Russ coolly stated he didn’t know what they were talking about. Hartnett summoned the police, and Smrekar was arrested. The following day, September 22nd, Smrekar was arraigned in court and charged with one count of burglary and two counts of theft, which included felony Theft Over. Two days later, on September 24th, Smrekar’s “Lincoln girlfriend,” student Patti Gunther, put up $500 and bailed her bad boy out of jail. Gunther, from Skokie, Illinois, was a short, overweight, no-holds-barred broad with long, dark hair and a forked tongue. She and Russ had met the previous year (’74) at a campus Halloween dance and taken to each other instantly. Gunther could also be devious. For example, she desired a private room, like Russell’s, so she did things to drive her roommate out—she poured detergent into her roommate’s goldfish bowl and killed all her fish. The roommate reported the incident, but Gunther denied having anything to do with it. Smrekar and Gunther were the perfect couple, a match made in Hell. The same day Smrekar bonded out of jail, the Lincoln College Judiciary Board found him guilty of the Hoyle Hall burglary. Mansfield had reluctantly testified against Russ in the hearing. Russ was instructed in a formal letter, “not to return to campus under any circumstances” without written consent from the Dean of Students. Following his expulsion, Smrekar deserted campus, but he returned to Lincoln on October 1st with his “Joliet girlfriend,” Melissa K. Smith, a 17-year-old streetwise blonde who tolerated Patti Gunther in her love triangle with Russell. Around 2 p.m. that day, Gunther and her roommate, Lois Sloan, Missy, and Russell all piled into Gunther’s ’68 green Renault and drove up Woodlawn Road to Kroger grocery store. All four went into the store, but Russell lingered a while longer after the girls returned to Gunther’s car in the parking lot. Jay Fry, the produce clerk, was working near the front entry sorting and stocking produce when he saw Smrekar in the drug aisle looking around “acting suspicious.” Fry hid behind a candy display and observed Smrekar holding a package of meat in his right hand. Smrekar then left the drug aisle and walked through the turnstile into the adjoining Super X drug store without paying for the rib-eyes. Fry lost sight of him after that and immediately alerted the store managers of the shoplifting. Lincoln realtor Ruth Martin, 51, a fun-loving Phyllis Diller type, had just purchased her groceries and was walking to her vehicle when she caught a glimpse of a longhaired hippy being chased by Fry and the two managers. Smrekar weaved around some cars and quickly tossed the meat package under Martin’s Pontiac Catalina as he whizzed by. Ruth went about her business, putting her groceries in her car, then backed out of her space and drove off. Fry walked over and retrieved the ditched steaks, still cold. Smrekar was apprehended and the police were summoned—it was his second arrest in just eleven day’s time. Russ was allowed to speak to his female cohorts before he was carted away to the station for booking. Approximately forty-five minutes later, he was released on his own recognizance and told to appear in court on October 20th. Smrekar was now standing charges on two separate thefts involving several witnesses who’d inevitably be called to testify against him, and that set his wheels spinning. On December 18th, Mansfield and his attorney appeared in the Logan County State’s Attorney’s office to discuss a plea deal. Mike was offered a Deferral of Prosecution Agreement whereby his prosecution would be deferred for 6 months if he agreed to testify fully, completely and truthfully in the burglary case against Smrekar. Mansfield signed the agreement, and then went home to Rolling Meadows to spend the holidays with his family. On December 31st, the state’s attorney’s office was notified that the two female burglary victims would be out of the country until January 19th and unavailable for their January 5th hearing. The burglary case was continued to March 2, ’76, unbeknownst to Mansfield and Smrekar. Michael and his mother, Renee Mansfield, were busily preparing for a New Year’s Eve gathering at their home when the phone rang at approximately 2 PM. Michael answered the call in his parents’ bedroom. A few minutes later, he told his mother he was going out for an hour or so and would be back. He said nothing about the phone call. He put on his buckskin coat, walked out the front door, and left his wallet behind. He didn’t have a car, so he was on foot. That was Renee’s last sight of her eldest son. Marv and Renee Mansfield called the Rolling Meadows PD the next day to report Mike missing. When college classes resumed after the holidays, Mike’s friends were puzzled that he hadn’t returned, but no one called the Mansfields. On January 16, ’76, Lincoln College President J. Richard Stoltz wrote a letter to Michael congratulating him on being named to the President’s List as a result of his academic performance. It was an honor of which Michael was never aware. Mike didn’t make his March 2nd court date; the Court issued an order for him to appear on March 16th for having violated the terms of the Deferred Prosecution Agreement. Marv and Renee phoned the Logan County State’s Attorney’s office sometime between March 4th and 16th wondering what would happen if Mike failed to appear for his upcoming court date. They were told a warrant would be issued for his arrest, and if he didn’t cooperate, he’d be prosecuted on the theft charges. The Mansfields kept expecting Mike to walk through the door any day, but that never happened. It wasn’t until early September of ’76 that the Logan County State’s Attorney’s office finally learned that Mike had left home on December 31st, never returned, and was officially a missing person. Months earlier, and not long after being stolen, the Joliet PD recovered the B.C. Rich guitar from the apartment of Missy Smith. It was then shipped to the Lincoln PD and taken into evidence. On March 6, ’76, a cunning cat burglar climbed a ladder to a second floor rear window of the Lincoln Police Department CID, broke in with a glass-cutter, and made off with the B.C. Rich. With the main evidence and the key witness, Mansfield, both missing, the college burglary case was eventually dismissed with leave to reinstate. As a result, Smrekar was entitled to a refund of $450, which he collected on September 13, ’76. Russell Smrekar evolved from a wily thief into a cold, calculating serial killer; his M.O. was eliminating witnesses about to testify against him in court. He was finally arrested at the Logan County Courthouse on October 18, ’76 where he was appearing on the continuing Kroger shoplifting case. The first trial ended in a hung jury. The second trial was also declared a mistrial. Then, witness Ruth Martin, who was to testify on June 8th, disappeared on June 2, ’76, causing the case to be continued, once again. On October 9th, witness Jay Fry and his 3-months pregnant wife, Robin, both 24 and strikingly good-looking, were shot-gunned to death in their home, thereby eliminating Fry as a witness. Mansfield and Martin had both disappeared 6 days before they were to testify. Smrekar was ultimately convicted of the Fry double homicide and sentenced “to spend the rest of his life in prison” with two consecutive terms of 100 to 300 years. Smrekar reportedly succumbed to a “terminal illness” in late October of 2011. Before expiring at Menard Penitentiary, he was said to have made a “deathbed confession” to killing Mansfield and Martin. The Lincoln PD claimed Russ admitted burying Ruth under the construction of Interstate 55 (a location that can never be excavated) which was underway to replace old Route 66 at the time of her disappearance. He apparently never divulged what he did with Michael. Russell was a pathological liar who loved leading the police on wild goose chases. I corresponded with him in 2007. I had tentative plans to meet with him at Menard and was added to his visitors list. In regard to Mansfield and Martin, Russell wrote to me, “Don’t wish a cold case to get too hot. Everybody likes a good Whodonnit, [sic], and reality is that they are and will remain unto eternity unsolved.” His avowal didn’t sound like a sociopath who’d suddenly get religion four years later and make a “deathbed confession.” The remains of Mike and Ruth have never been found, so their cases remain unsolved; yet, the Lincoln and Rolling Meadows Police Departments have treated their cases as if they’re closed. 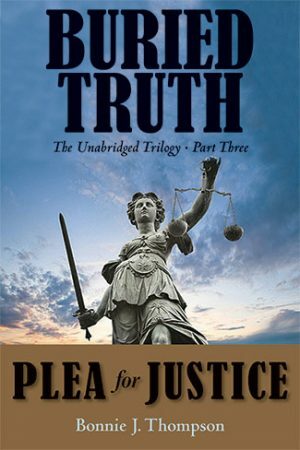 Russ was surely involved in the murders of Mike and Ruth, but information and evidence contained in their files strongly suggests that he used accomplices. 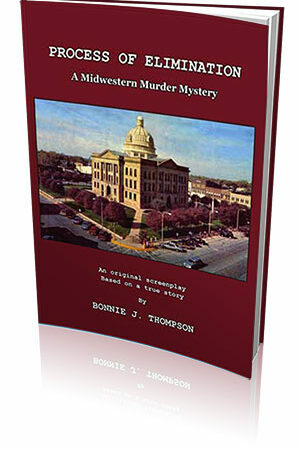 I’ve spent many years researching and reinvestigating the Mansfield and Martin cases. I interviewed Melissa K. Smith Votano on a number of occasions. Initially, she purchased my screenplay, Process of Elimination, read it (she’s a character in the script), and then she contacted me and we spoke on the phone. She’s a loquacious, outspoken but likeable, incessant smoker who can spend hours on end reliving her past with Russell. Unfortunately, I’ve never spoken with Patti Gunther, who lives in upstate Illinois. Missy’s rivalry with Gunther is as present and palpable as it was over 40 years ago. She’s quick to point her finger at Patti, and I presume Patti would not hesitate one iota in pointing her finger at Missy. 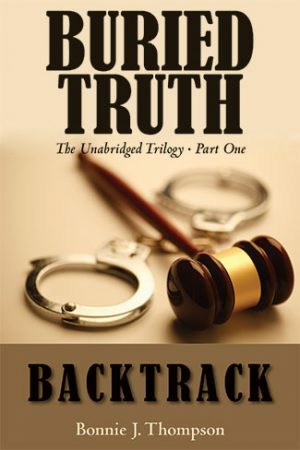 Neither woman is to be trusted or believed with respect to their past ties to Russell and his murder sprees. Russ was a braggart, and in my fervent opinion both women know much more than they’ve ever admitted. In August of ’76, Melissa’s own mother advised detectives that if her daughter were questioned about Russell “she would lie.” Melissa’s the only person known to have been in Russell’s company on both days that Mansfield and Martin disappeared. Her detailed recollections of the circumstances on those two dates have been dramatically inconsistent; in numerous instances and at different times, she contradicted what she told authorities in ’76, as well as what she reported to me years later. I confronted her about it. She unflappably admitted, “Well, I may have lied to them,” she laughed. “Right,” she agreed indifferently. She then continued to present additional excuses for why she lied to police and withheld important information about the circumstances concerning the day and night of Mansfield’s disappearance. Mike Mansfield had his whole life ahead of him and a family who loved him. They love and miss him still. 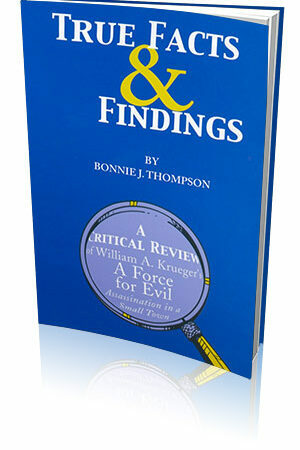 The investigations conducted in ’76 were not thorough. There should have been more focus on Smith and Gunther—both women should have been extensively interrogated and investigated. Missy is amiable, and she presents herself as concerned and cooperative all these years later, but she can’t keep her stories straight, and she’s clearly not telling the whole truth. She admitted not telling the truth in the past. The truth is simple. Lies are what make things complicated. The only physical evidence that ever existed in Mike’s case were some cards and letters his girlfriend received supposedly written and mailed by Mike after he disappeared. Apparently, those penned correspondences – obviously written by someone involved in Mike’s murder and not by Mike – no longer exist, which is extremely frustrating and unfortunate. Other than that, Mike just vanished into cold, thin air. 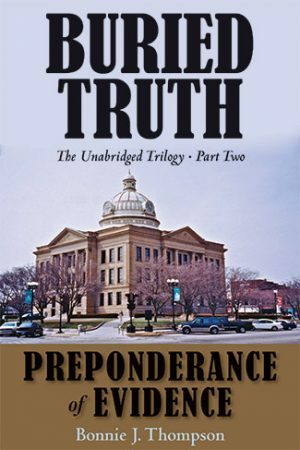 In 2008, Renee Mansfield emotionally expressed to me, “Mike’s case is probably sitting in a box somewhere and forgotten. We just want some closure so we can put it behind us. I’m gonna hang on to this till the day I die. That’s what’s gonna happen.” Sadly, Renee passed away on October 31, 2014. 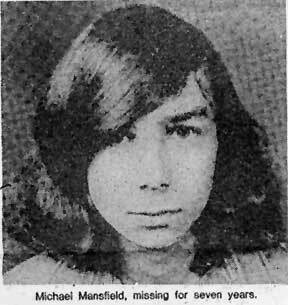 Michael David Mansfield has been missing for 41 YEARS now, and he still deserves justice. Please take a moment and say a prayer for Michael this New Year’s Eve. Pray that further investigation into his murder is conducted in 2017. There’s a PETITION ON THIS WEB SITE calling for further investigation, please sign it.